The last time these two teams met, Kings XI Punjab polished off a chase of 176 with great ease. But just a couple of games later, both teams have seemingly moved to the opposite ends of the spectrum. That KXIP which showed no nerves in the chase seems to have vanished. They won their previous game only by the skin of the teeth against Sunrisers Hyderabad but just before that they couldn’t chase down 160 against Chennai Super Kings despite two of their batsmen scoring fifties. “Nobody wins, one team just loses more slowly,” a quote from The Wire, could possibly sum up their newfound penchant for messing up straightforward chases. On the other hand, Mumbai Indians come into this game on the back of two successful outings defending a target, after that loss against R Ashwin’s men. A couple of games could still be too small a sample size to gauge deep-seated weaknesses. But this recency bias, could factor into the toss come match day when any and every weakness if sought to be exploited. And such trends will be all the more important in a group stage that is shaping up tightly between six teams, including the two featuring here. 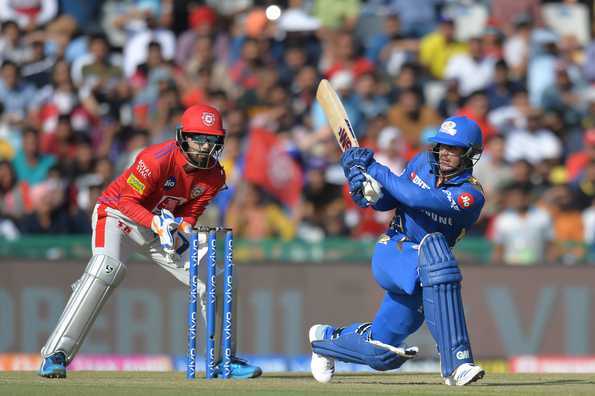 What to expect: One of Mumbai wins came at this venue, which has worked in a way that opposes a growing norm of slow and turning pitches in the IPL. In the only other game played here this season, a total of 389 runs were racked up. It’s safe to say then that this promises to be no different, with batsmen being more favoured. Mumbai Indians:The globetrotter Lasith Malinga has made his way back into the Mumbai Indians camp on the eve of the game. But even he will find it near impossible to dislodge a man who racked up the best ever bowling figures in the IPL in his debut game. It could be a toss-up between Malinga and the left-arm variety of Jason Behrendoff for the final spot. The other possible area of concern could be Quinton de Kock’s form with Evin Lewis in the waiting. But de Kock’s only fifty of the season came against the very same opponents which could still enable him to hold onto his spot. Kings XI Punjab:There’s no saying what Ashwin could pull out of his hat. But that said, there aren’t any pressing worries for KXIP to change the eleven that won their last outing only recently. Their concerns would revolve around how their batsmen pace their innings in a T20 game. A key figure in that aspect, Chris Gayle, has had some quiet outings and could just find a pitch that is more suited to his liking.